We offer a unique range of industrial drying tumbler, which are specially designed for drying knitted fabric rolls, all types of garments, quilts, bath mats, towel fabrics in order to get uniform drying, rapidity softness & shrinkage control. The range we offer in industrial drying tumbler are specially designed for hosiery dyeing industry, garment export industry, denim processing units, towel dyeing units, home furnishings and all types of laundry works for hotels and hospitals. We are the leading manufacturer, supplier and exporter of Industrial Drying Tumbler (Tilt Feature) in India. Available with forward tilt for easy uploading. The forward tilt allows the linen to fall into a trolley, making unloading economically correct, reducing work related injuries and improving work flow. Available in 15, 30, 60, 120, & 240 kg. Dry weight per charge capacity. XSoni systems drying tumbler is specially designed for hosiery dyeing industry, garment export industry, denim processing units, terry towel plants and home furnishings. 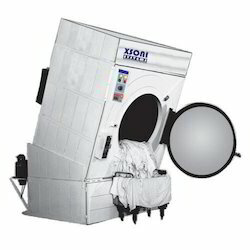 All types of laundry works for hotels or hospitals to get uniform drying, rapidity softness & shrinkage control, front loading, open pocket, large dia die pressed, powder coated door stainless steel inner basket, outer body double walled glass wool insulated, centrifugal high suction powerful blower used. Automatic control panel for auto reverse or forward auto digital temperature control functions. Heating systems electric, steam, thermic heat transfer fluids, indirect oil or gas firing. This drying tumbler or also known as industrial dryers is widely used not only in India but in Gulf countries as well. Indirect diesel fired heating systems specially designed heat exchanger with automatic imported diesel or gas burners. High efficiency, low cost & easy to install. Tumble Dryer offered comes with superior working mechanism that provides for perfect cleaning support. Clothes Dryer offered comes designed and developed using latest technology support for reliable performance. Available in 10,15, 30, 60, 120 & 240 kg. dry weight per charge capacity. Xsoni Systems‘Laundry Dryer is especially designed for Hosiery Dyeing Industry, Garment Export Industry, Denim Processing Units, Terry Towel plants, Home Furnishings. All types of Laundry Works for Hotels/Hospitals to get uniform drying, rapidity softness & shrinkage control.Front loading, Open pocket, Large dia Die pressed, Powder coated door Stainless Steelinner Basket, Outer Body Double walled Glass wool Insulated, Centrifugal High Suction Powerful Blower used, Automatic Control panel for Auto Reverse/Forward Auto Digital Temperature control functions.Heating system in Electric/Steam/Thermic Heat Transfer Fluids/Indirect Oil/Gas Firing.